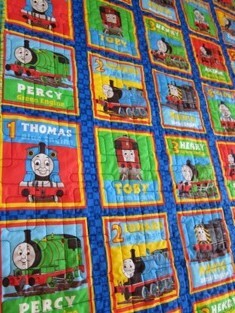 And....I would never learn as I have done it so may times....cutting fabric while I'm half-asleep.... 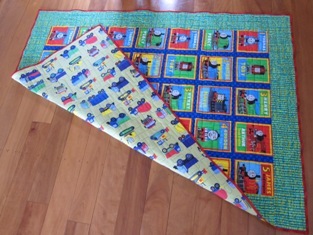 I didn't cut one of the back panels quite wide enough, hence, creative thinking was put to good use. 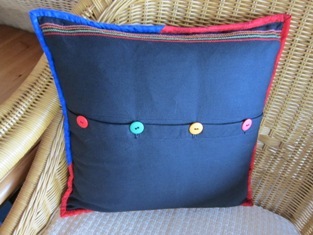 With different colours of the wools to match the buttons and the zigzag stitch, I was able to hide the seam where I joined the two pieces of fabric.!!! 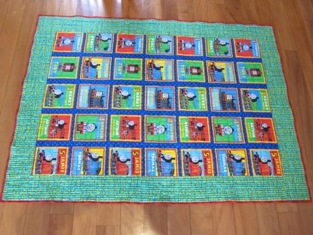 I also managed to fit in another quilt for my 'Sunshine' before he started his BIG school (kindergarten), in the first week of February. 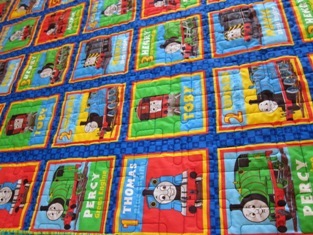 It's 'Thomas the Tank Engine' and is his current 'favourite' blanket. 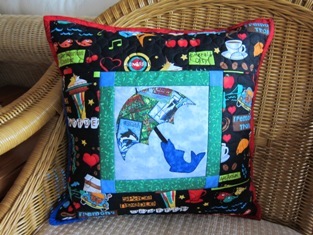 I quilted it on my Gammill Statler with Laurie Thomas's 'box maze' pattern. 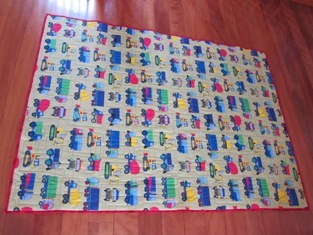 I used the flannel flat sheet, which had never been used, as the backing. 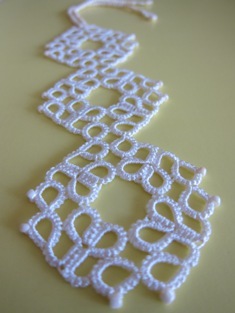 Soon after the cushion and the quilt were finished, my 'annual' intensive tatting has begun. 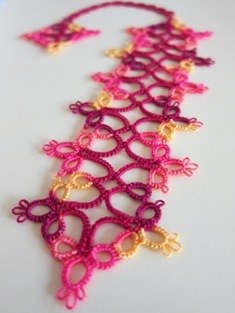 I started off with tatting an edging piece for the 'Hanky Panky' Exchange with the Canadian tatters. With all my good intention to tat a complicated edge, it didn't work out, and in the end, I went with my own favourite scallop edge pattern that I could tat with one eye closed.!!! 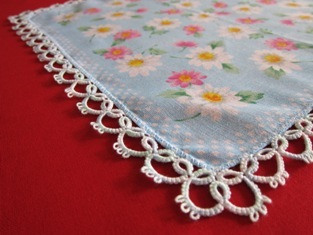 Sewing the piece on the handkerchief wasn't too straight forward, and so, took some time before I got it finished, washed and ironed. As soon as I have shown it to my fellow tatters at the Guild's February meeting in a couple of weeks, it will be on its way to Canada. Next pieces that I have tatted are the bookmarks to be entered to this year Castle Hill Show. 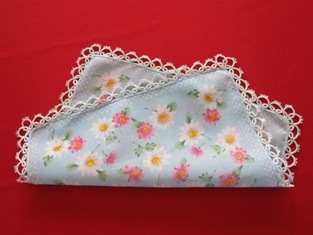 I have got free patterns from the experienced tatters who kindly share their patterns through the internet. I'm grateful for them all. I, as usual, modified the patterns slightly, to my liking....Up to this point in time, I have only kept the first bookmark that I ever tatted, and all the other bookmarks, including the prize-winning ones, were given away. I intend to keep two of the three to myself this time. The other one is most likely to be travelling to a friend in Russia. ....When I was learning to tat 4 years ago, 'split ring' was quite a daunting technique to accomplish. Being the person who I am, I took on the challenge (my own), and after a few crooked split rings, I'm quite comfortable with the technique. 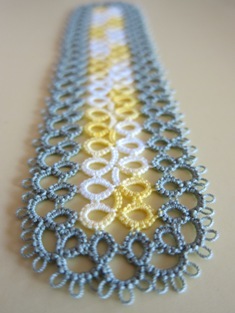 I'm now ready to start a doily with the pattern dominated by split rings. 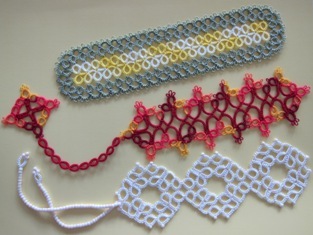 I really like the pattern, and again, it's free through the internet. I'm very much thankful for it. This doily will be my next and last substantial tatted piece for this year....I hope to finish it within this coming week, and with the cotton size 50, I'm sure to have my eyes crossed for a few days after that.!! !